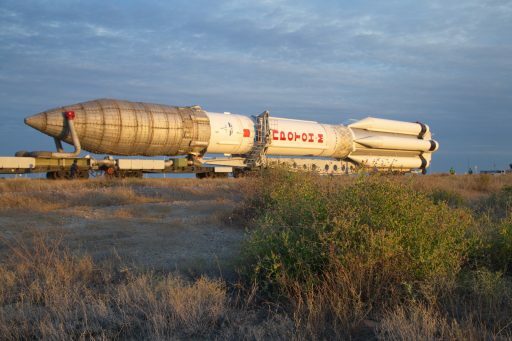 Out of public sight, a Proton-M rocket was rolled to its launch pad at the Baikonur Cosmodrome last weekend in preparation for liftoff as early as Wednesday with the second satellite in a dual-purpose civilian and military communications network operated by the Russian Ministry of Defence. According to air route closures, liftoff appears to be on schedule for Wednesday at around 22:12 UTC. Mirroring the first launch campaign for Russia’s Blagovest satellite system, no photos or information on the upcoming launch are available through official channels. It is however understood that Wednesday’s launch will involve the second of four satellites for building a super-high-throughput communications infrastructure for domestic use in the military and civilian sectors. The mission will mark the first Proton launch in nearly seven months, coming after the September 28, 2017 flight with the commercial AsiaSat 9 communications satellite. 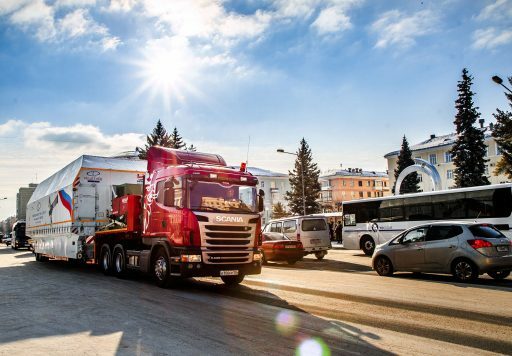 Blagovest 12L was initially expected to fly on Christmas Day 2017 before drifting into 2018 due to delays on the payload side which ultimately pushed the launch to April 19 local time at the Baikonur Cosmodrome. 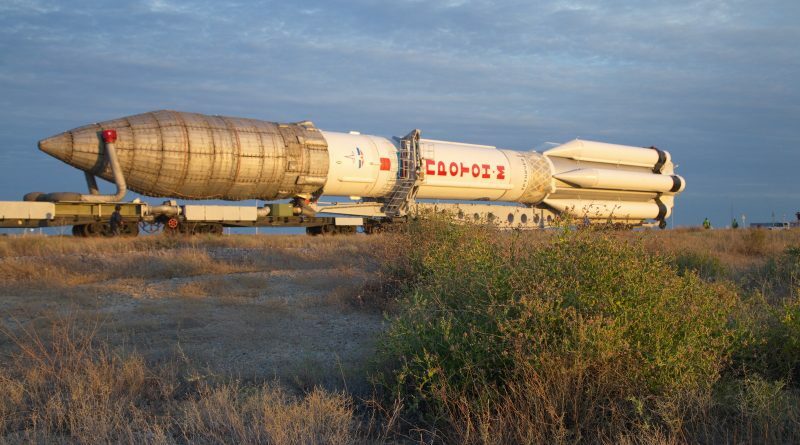 According to Russian sources, preparations over the last two weeks have been running smoothly with the payload section being installed on the three-stage rocket on April 10 followed by the rollout to Baikonur’s Site 81/24 on Sunday. The Blagovest 12L launch campaign appears to be similar to that of the first satellite last year in that no information on the mission is being released by Roscosmos or the Russian Defence Ministry in the run-up to the planned launch. This also indicates that no real time insight into the mission will be available and observers will only learn of the injection of the satellite through press information or western radar tracking after the fact. Blagovest, also known under its military code name 14F149, is a four-satellite constellation operated by the Russian Ministry of Defence with ISS Reshetnev acting as prime contractor for the satellite. 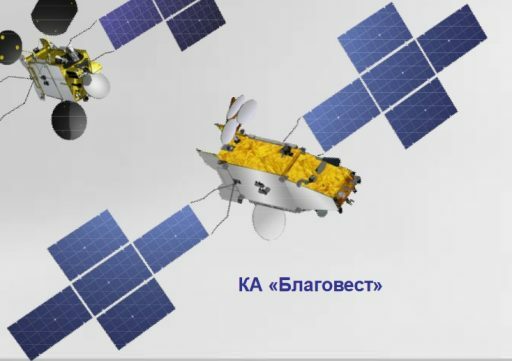 According to available information, Blagovest employs Reshetnev’s Ekspress-2000 satellite platform and a high-throughput communications payload also designed and built by the Zheleznogorsk-based company. Documentation shows the project was initiated around 2010/11 with an initial launch target in 2015 but slipping significantly due to an investigation into the unreliability of Proton’s rocket engines. The primary role of the Blagovest satellites is in secure communications for the Russian Defence Ministry across the Russian Territory and the Eastern Hemisphere, but satellite builder Reshetnev also states the satellites will be available for civilian services like TV and radio distribution, broadband Internet access, data-intensive services and video conferencing. The secrecy surrounding the missions suggests the satellite’s military role outweighs its part in commercial communications, though reports indicate Blagovest will be made available for large commercial customers. 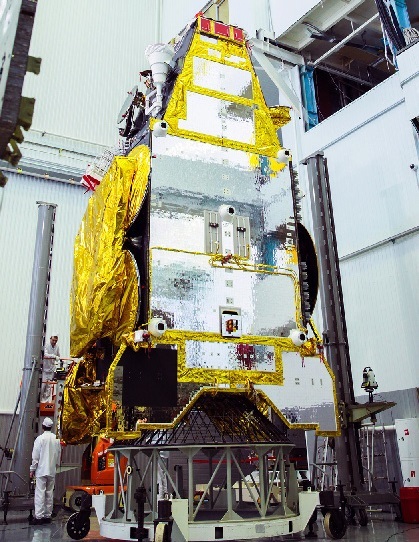 The Blagovest satellites are fitted with a high-throughput communications payload operating in the Ka-Band frequency (26.5-40 GHz) and the Q-Band Extremely High Frequency Range of 33 to 50 GHz, making the satellite one of the first to operationally use Q-Band communications that can support higher bandwidths. Documentation by Thales Alenia confirms Blagovest uses Q-Band filter equipment and Ka-Band input multiplexers from the company and a presentation by Spanish Company RYMSA also shows the satellite as having a C-Band payload – to be used to cater to heritage systems that do not yet support Ka-Band capability. A number of telecommunications providers and satellite operators have expressed interest in exploring EHF communications as part of their long-term business models – firms interested in the technology include GEO satellite giants like Eutelsat & Intelsat as well as operators exploiting Low and Medium Earth Orbit, namely Iridium, OneWeb and O3b. Blagovest is the first known application of Q-Band for fully operational services on a Russian satellite. The Ekspress-2000 satellite platform is Reshetnev’s most-capable bus for Geostationary application, typically weighing 3.0 to 3.5 metric tons at launch and capable of hosting payloads of 1,000 Kilograms. The platform can support a payload power of up to 15 Kilowatts, offers excellent three-axis stabilization, precise stationkeeping capabilities and can combine chemical and electric propulsion systems. Specifications such as launch mass or details on the payload are not available for the secretive Blagovest mission. 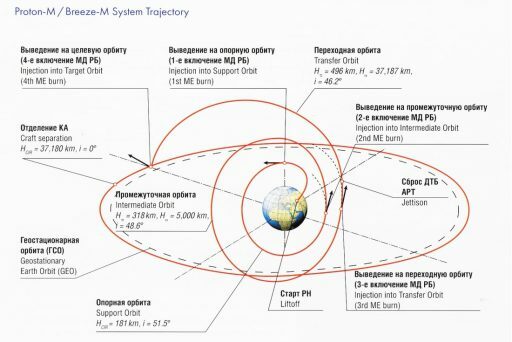 If launching on Wednesday, Proton-M/Briz-M will be tasked with a lengthy direct-to-GEO mission, requiring four burns by the Briz-M upper stage and creating an ascent profile of around nine hours and three minutes from liftoff from Baikonur’s Site 81/24 to separation of the Blagovest 12L satellite. Proton-M stands 58.2 meters tall and measures 7.4 meters in diameter with a launch mass of 712 metric tons, holding some 622 metric tons of toxic Unsymmetrical Dimethylhydrazine and Nitrogen Tetroxide, loaded into the three-stage launcher six hours before liftoff. The Briz-M, serving as upper stage, was loaded with its own supply of 20 metric tons of hypergolics prior to the rocket’s rollout to Site 81/24. 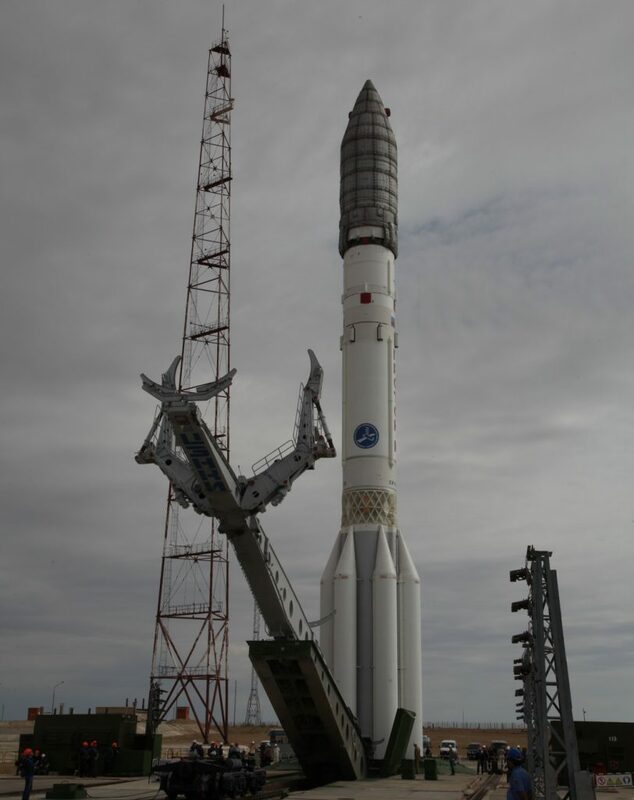 Firing up its six RD-275M engines, Proton will thunder off with a liftoff thrust of over 1,000 metric-ton force, climbing vertically before turning to the north-east to depart Baikonur along the standard 61.3-degree launch azimuth for Proton missions with Geostationary Satellites. Proton’s 21.2-meter long first stage with its internal oxidizer tank and six characteristic fuel tanks clustered around it will be in operation for the first minute and 58 seconds of the flight, burning 419,400 Kilograms of propellants before handing over to the second stage. Firing up its four RD-0210/0211 engines, the second stage will continue pushing Proton toward space with a thrust of 244 metric tons. Separation of the second stage will be assisted by the third stage’s four-chamber vernier engine, occurring five minutes and 27 seconds into the flight after the second stage consumed 156 metric tons of propellant. The RD-0213 main engine will light up on its four minute burn four seconds after staging and Proton will drop its protective payload fairing another 15 seconds later when aerodynamic forces are no longer a concern. Burning 46,600kg of propellants and delivering 62,600 Kilogram-force of thrust, the third stage will be tasked with placing the stack onto a sub-orbital arc, handing off to the Briz-M upper stage nine minutes and 42 seconds after launch for a multi-burn, multi-hour ascent mission. Briz-M, weighing in at 22 metric tons, hosts a 2,000kgf S5.98 engine that can support multiple firings separated by long coast phases to sequentially maneuver up into a high-energy target orbit. 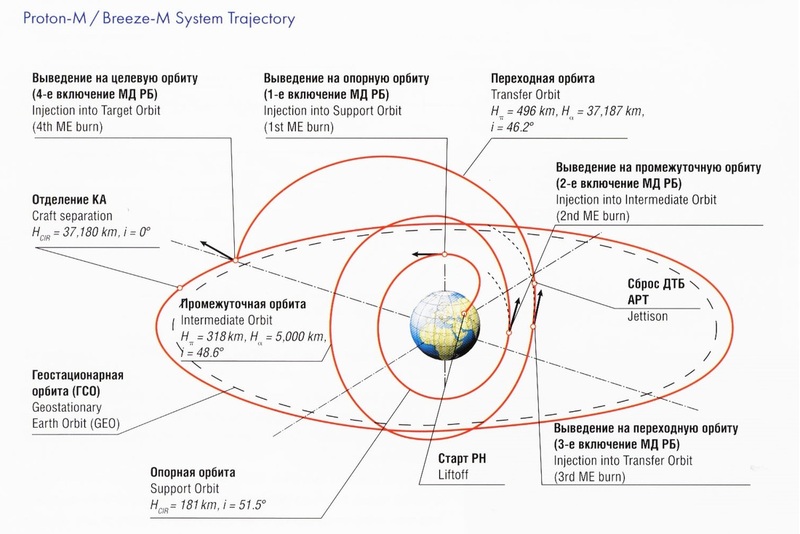 Starting out on a sub-orbital arc, Briz-M will first be tasked with lifting the stack into a Low Earth Parking Orbit for a coast phase of a little over an hour ahead of a two-burn campaign to lift the stack into Geostationary Transfer Orbit. Because of the low thrust of the Briz-M engine, the apogee-raising operation is spread over two consecutive orbits with two engine burns occurring centered on the equator. Following the third burn, Briz-M will separate its Auxiliary Propellant Tank and settle down for a long coast phase, climbing all the way up to apogee. A fourth and final burn of the Briz-M engine will circularize the orbit and reduce its inclination to zero in order to separate the Blagovest satellite into a Geostationary Drift Orbit while Briz-M conducts additional maneuvers to enter a graveyard orbit.